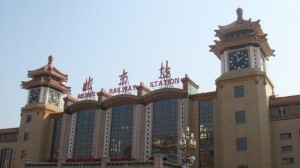 There are four railway stations in Beijing. They are Beijing Railway Station (oldest one), Beijing South Railway Station (bullet trains), Beijing West Railway Station and Beijing North Railway Station (to Badaling Great Wall). If you take a train to get to Beijing or you are leaving from Beijing by train, you should make sure you are on the right train station. If it is your first time to take a train in China, it is advised to learn some basic information about taking trains in China. Click here to view How to Take Trains in China. How to buy a train ticket. Beijing Railway Station is the top grade national station that serves many lines, including Jingshan (Beijing to Shandong), Jingqin (Beijing to Shaanxi), Jinghu (Beijing to Shanghai), Jingcheng (Beijing to Chengde City of Hebei Province), Jingyuan (Beijing to Shanxi) and Jingbao (Beijing to Baotou in Inner Mongolia Autonomous Region). There are also international passenger trains that serve the Pyongyang, Ulan Bator and Moscow routes. Moreover, it also serves as a link between the inhabitants of the capital and the rest of the nation, as well as the Chinese people and the rest of the world. By Subway: Subway Line 2 to Beijing Subway Station, get off the exit C (southeast) and then walk to the Beijing Railway Station. 1. Bus No.9, 10, 20, 25, 39, 59, 122, 203, 209, 403, 434, 639, 673, 729, 938 to Beijingzhan Dong, and then walk to the Beijing Railway Station. 2. Bus No.24, 403, 420, 457, 637, 639, 640, 668, 673, 674, 692, 728 (branch), 729, Te 2 to Beijingzhan Qianjie, and then walk to the Beijing Railway Station. By taxi: The cost from midtown Beijing to Beijing Railway Station is normally around RMB25 depending on the type of taxi. Trains departing from Beijing West leave for destinations to the Central South China, South China, Southwest China and Northwest China. 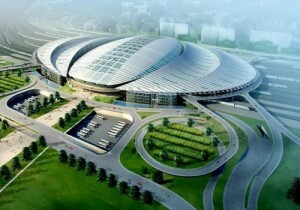 The construction of this station has greatly relieved the transportation pressure of Beijing Railway Station. Many trains depart from and arrive at this particular station, transporting more than 100,000 passengers a day. About 200,000 passengers would have gone through the station at its peak hours in a day, making it the nation’s largest and busiest passenger station. Address: East Lianhuachi Road, Fengtai District, Beijing. By subway: You can take Subway Line1 to Military Museum and then take No. 21,65,320,99 Bus to the station. By Bus: No.9, 21, 40, 47, 50, 52, 54, 65, 67, 205, 209, 212, 301, 319, 320, 373, 374, 387, 414, 437,609, 616, 661, 663, 673, 694, 695, 741, 802, 823, 937 (branch), 937 (expert), Te 2 to Beijing West Railway Station. By taxi: The cost from midtown Beijing to Beijing west Railway Station is normally around RMB40 depending on the type of taxi. Over 300 pairs of trains arrive and start from this station. This station serves for the trains of the high-speed railways, including the Beijing-Tianjin Intercity Railway and the Beijing-Shanghai High-Speed Railway and direct trains to Jinan and Qingdao. which can reach speeds above 350 km/h. 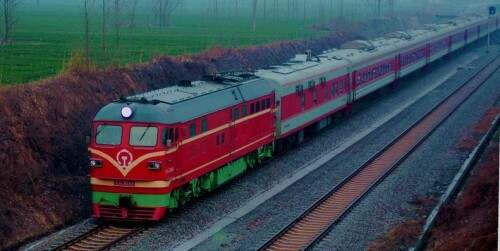 It only takes half an hour and five hours respectively traveling from Beijing to Tianjin and from Beijing to Shanghai. By Bus: No.20, 53, 63, 102, 106, 122, 203, 208, 377, 381, 454, 458, 485, 692, 741, 927 Qu, 939, 943, 958, 986, Te 3, Te 5, Yuntong 102 to Beijing South Railway Station. Beijing North Railway Station is a small station managed by the Beijing Railway Bureau that provides regular intercity train service to the north, northwest, and tourist trains to the suburb and nearby location of Beijing City, and the short-distance trains from Beijing to Hebei Province and Inner Mongolian Autonomous Region. By subway: Subway Line 2 and Line 13 to Beijing North Subway Station, get off the exit and then walk to the Railway Station. 1. Bus No.21, 331, 375, 387, 392, 490, 604, 650, 693, 743 to Suojiafen bus station, and then walk to the North railway station. 2. Bus No.27, Big 44, Small 44 Xiao, 206, 347, 618, 800, 939 to Yutaoyuan bus station, and then walk to the North railway station. By taxi: The cost from midtown Beijing to Beijing North Railway Station is normally around RMB35 depending on the type of taxi.